The draft for Article 1 reads, according to Egyptian newspaper Ahram: "The Arab Republic of Egypt is democratic, consultative, constitutional and modernized; based on the separation of powers and the principle of citizenship. Egypt is part of the Arab and Islamic nation, with strong ties to the African Continent." Article 2's draft reads: "Islam is the religion of the state; Arabic is the official religion of the state; and principles of Islamic Sharia are the major source of legislation. Al-Azhar is the major reference on interpreting the principles of Islamic Sharia and that non-Muslims, especially the followers of Christianity and Judaism, should refer to their religions on personal matters, religious affairs, and the selection of their religious leaders." The proposal for Article 3 reportedly reads: "Sovereignty is for the people alone and they are the source of authority. The people shall exercise and protect this sovereignty, and safeguard national unity in the manner specified in the Constitution." The Egypt Independent reported this week that drafts of the first two articles of the new constitution had been agreed upon by various religious members of the Constituent Assembly. Those involved in crafting the drafts were reportedly careful to appease those concerned with the direction of the country after the removal of former President Hosni Mubarak, and the installation of Mohammad Morsi. Evangelical leader Safwat al-Bayady was cited by the Egypt Independent as backing the draft articles, as were representatives of the Catholic Church and the Coptic community, the largest Christian group in Egypt. The only dissension seemed to be among the committee's ultra-orthodox Salafists, who took issue with Article 2 stating that "the principles of Islamic Sharia are the major source of legislation." According to Amrah Online, which reported on the assembly meeting on Thursday, Salafist assembly members have been aggressively pushing to implement Islamic Sharia law as more than just a guiding principle in legislative matters. "They also believe that Sharia law, not its principles, should be the main source of legislation to ensure that the hudood, or the ordinances of God â such (as) stoning non-believes and amputating the hands of thieves â be applied. The imposition of hudood, according to most Islamist conservative forces, is a necessity so that Egypt does not become a secular state and that it is committed to implementing God's laws," the publication reports. This aggressive push for Sharia in the draft of the new constitution, being framed around Egypt's 1971 constitution, has been interpreted as a warning sign among some observers who believe a reference to the Islamic religious code contradicts provisions for Christians. "Finally, Christians, it is implied, will be governed by their own religious laws. But this is a peculiar formulation. If Egypt is not governed by Sharia law then why would Christians need to be exempt from it? If this provision is restricted only to matters of personal status (principally marriage, divorce, and inheritance) then Christians would mostly be living under Sharia law in any state court. And what does this constitutional provision mean for example regarding the status of women, where Egyptian law has granted more rights than Sharia would do? Another important issue will be the appointment of future judges since many of the current magistrates oppose Sharia law as that of the state." Expressing skepticism over the appearance of a moderate Egypt emerging, Rubin adds: "No doubt though the Constitution will be interpreted by many Western observers of proof that the Brotherhood and Salafists have moderated." Although newly instated President Morsi, of the Muslim Brotherhood, vowed that the new Egypt would be democratic and more inclusive of its minority segments, doubts have persisted among some observers who believe the new president could be overpowered by hardline Islamists. Insisting last week that "Egypt is an Islamist state," David Schenker, also an expert in Middle East affairs, suggested that what was most important is understanding what kind of Islamic state Egypt would become. "Already, the Salafis have threatened to withdraw from Morsi's presidential team if he follows through on his commitment to include a woman and a Coptic Christian among his six vice presidents," he wrote. 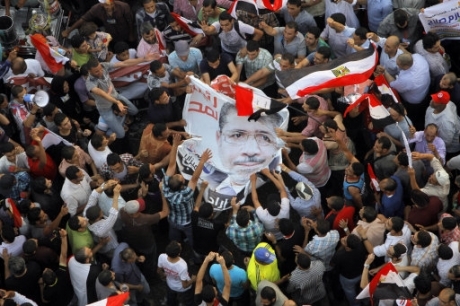 "In his victory speech, Morsi spoke about reconciliation. But going forward, nervous about being outflanked on its right, the Muslim Brotherhood will see little alternative to adopting the positions of its Salafi rivals, including a stricter interpretation of Islamic law," Schenker concluded. The Constitutional Assembly's present suggestions are not set in stone and will likely be debated further as the full body of representatives from among Egypt's population gather to decide what powers the executive, legislative and judiciary branches of government will hold.